This is an amplifier I designed for busking and just so I could play crazy sounding stuff in the fields around my house here in Sandy Mush. The design is tailored around some key criteria, namely; be able to provide 15 – 20 watts from a nominal 12 volt supply (10-16 volts), have a tube amp sound, reasonable simplicity and great sounding reverb. I am very pleased the final design. This is my primary practice amp now – mainly because I love the way it sounds and also I like seeing the bile drool out of the mouths of my mortified neighbors as I “rock out”. I am posting links to the original schematic and a version without the reverb – which simplifies the design a bit. I am also posting some pictures of the circuit board, a completed unit and some sound samples. 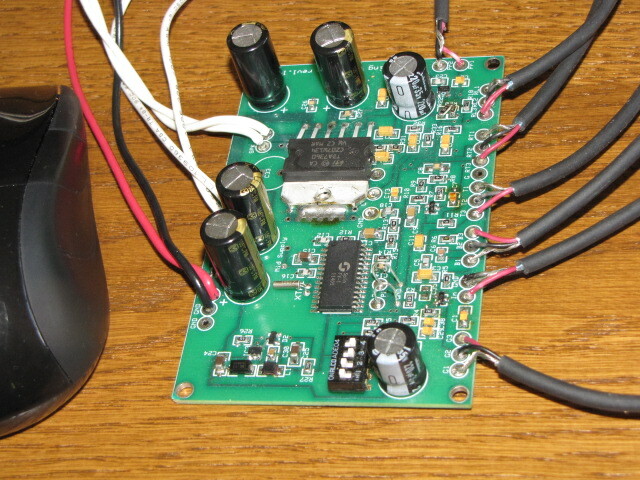 Power – I used as the final amplifier a TDA7360 car stereo amplifier in bridged mode. This amp sounds great and can provide 20 + watts through 4 ohms with a 14v supply. Some may shuddered in horror at the thought of this used for a guitar amp, but it really works well and is reasonably efficient, requiring only the circuit board ground plane as heat sinking. I use a small lead/acid gel cel to power this amp but also have used drill batteries and a computer wall wart, etc. Tube Sound – To achieve a tube like sound I used a classic fender type tone stack, discrete signal chain using jfets (up to the power amp) and negative feedback from the speaker to the final preamp stage. If you look at the circuit, you can see that basically all of the active devices could be replaced with tubes and the TDA7360 with a couple of output tubes and a transformer. 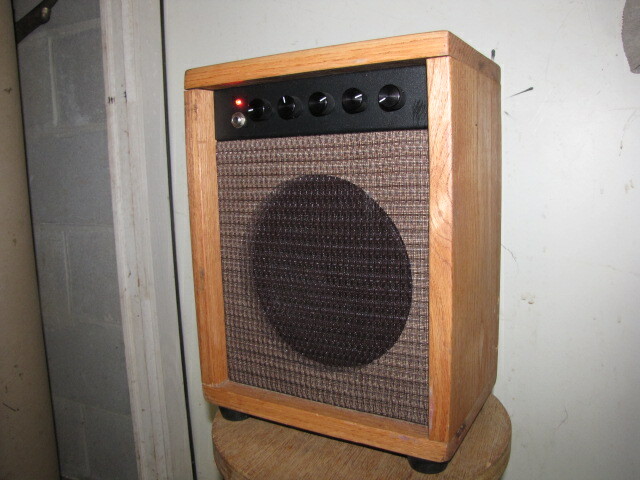 The negative feedback from the speaker is a classic technique in tube amps and applied here, has a noticeable effect on the sound. Simplicity – I set a limit on physical size and number of knobs which forced me to keep it simple. Reverb – I thought seriously about integrating a spring reverb, but went with a DSP circuit, the FV- 1 chip, instead. This IC provides a number of reverbs and other effects which are selectable via switches(jumpers). It is easy to use and I was able to color the reverb with filtering to my taste. It is essentially an effects unit on a chip. I very pleased with its performance. The reverb has both room size and depth control, and provides all kinds of variation. Design Notes: There is flexibility in this design – you don’t have to use a switch mode 3.3v power supply for the FV-1 like I did – you could just use a linear regulator. I use a PMOS FET as a NO VOLTAGE DROP protection diode. This could also be omitted. I hate to lose .7 volts with a regular diode though – so I recommend the PMOS approach. The choice of JFET was based on what I had kick’n around – nothing else. I also tried it using LND150’s with similar results. My tone stack is nothing special and many other variations could be used. The volume control at the very front may seem odd. In fact, at very low volume settings, there is treble roll off because of stray capacitance of the POT. The reason I did it was to maximize headroom of the preamp stages and simplicity. This is a design choice that merits a second look. The amount negative feedback from the final to the driver stage is adjustable or can be omitted. A high-end treble control (presence) is realised by bypassing this feedback for very high frequency. This too can be omitted. For the speaker I used a $22 Jensen 8″ MOD. I highly recommend this speaker – its cheap and sounds perfect.